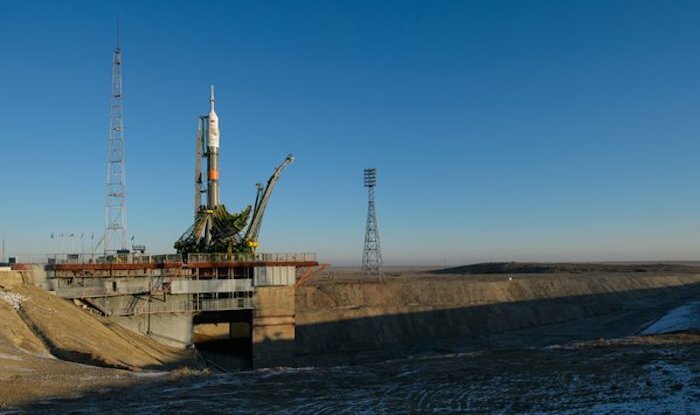 Watch the launch of ESA astronaut Tim Peake, NASA astronaut Tim Kopra and Russian commander Yuri Malenchenko to the International Space Station on 15 December at 11:03 GMT (12:03 CET). 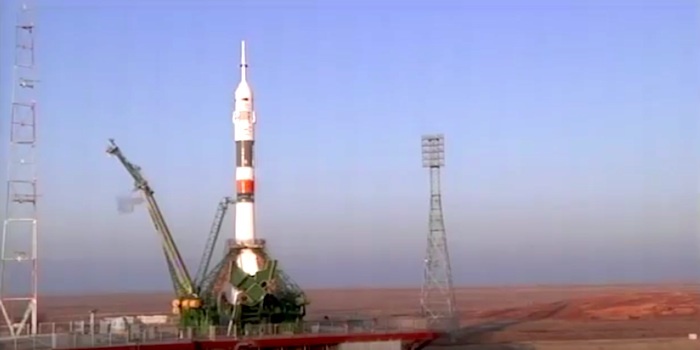 Launch coverage starts at 11:00 GMT (12:00 CET). The father of Britain's first official astronaut says he is more nervous about his son's journey home on the M27 than his historic six month mission in space. Tim Peake, 43, has spent the past 12 days in quarantine ahead before his Russian rocket begins its journey to the International Space Station (ISS) on Tuesday. 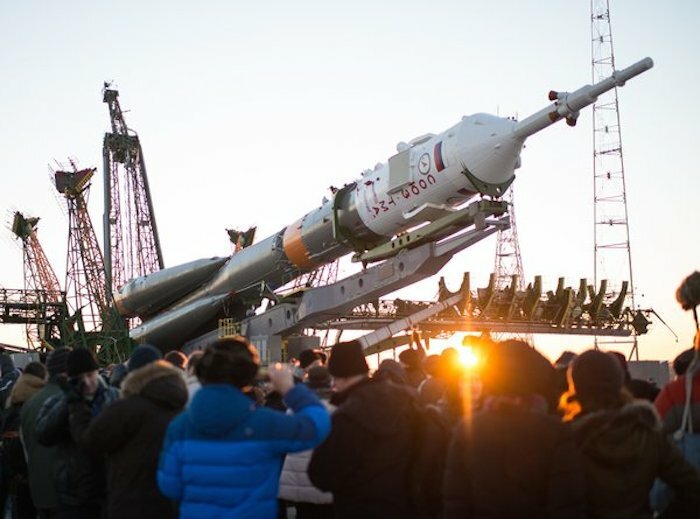 His father, Nigel, said he was "immensely proud" after watching the the 162-ft long Soyuz FG rocket being lifted onto its launch pad. He added: "We're not worried at all. We've been following his training and know how thorough it is, so we don't have any fears. I'm more worried about him driving home on the M27. That's far more dangerous, believe me, than going up there." 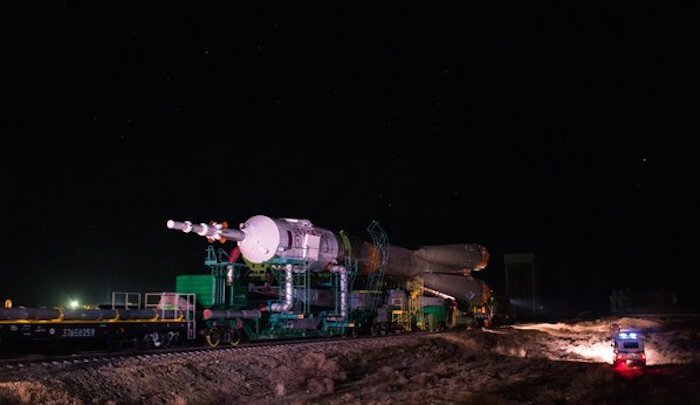 Tim, from Chichester, and his wife Angela stood yards away from rocket as it was slowly manoeuvred into position ready for blast off from the Baikonur Cosmodrome in Kazakhstan. He said: "As you can imagine, it's quite surreal to think you're the father of an astronaut, especially a British astronaut. So we're very, very proud, and just a little bit over-awed by the whole operation." 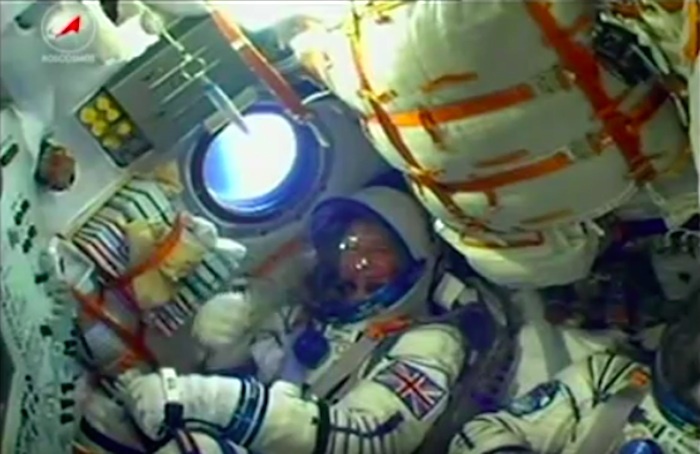 Major Peake, 43, is the first 100% British professional astronaut to leave the Earth and he takes off as the UK's first National Space Policy (NSP) is launched. The Government has announced plans to make the UK the European hub for commercial space flight and space technologies, with investments in space flight and microgravity research that will give an £11.8 billion boost to the economy. Previous "Brits in space" have either had US or dual citizenship and worked for the American space agency Nasa, or been on privately funded or sponsored trips. The father-of-two, a former Army aviator and helicopter test pilot, is employed by the European Space Agency (Esa) and sports a Union Jack on his sleeve. Travelling with him in a tiny Soyuz TMA space capsule will be Russian crew commander Yuri Malenchenko and American Nasa astronaut Tim Kopra. They are scheduled to spend almost six months aboard the space station, which orbits the Earth at an average altitude of 220 miles. 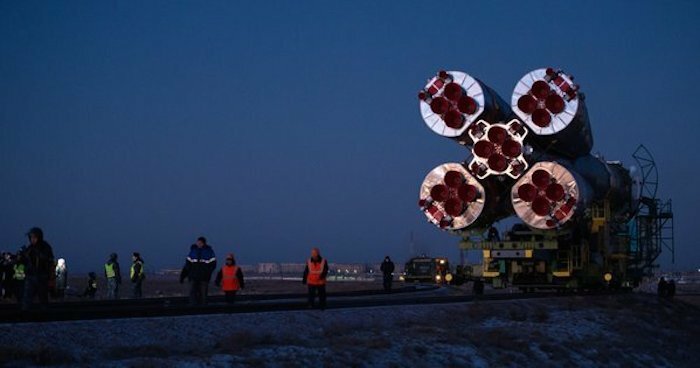 "Roll-out" of the three-stage rocket took place just as the sun began to rise over the bitingly cold and snow-frosted Kazakhstan steppe desert. Laid on its side, the 305 tonne metal leviathan was hauled out of its assembly hanger by a powerful diesel locomotive that pulled it along five kilometres (3.1 miles) of railway track to the launch complex. There, the rocket was carefully lifted to its vertical launch position by a hydraulic ram. The grey, white and orange machine looked somewhat unreal - a scaled-up version of a Thunderbirds model. Watching was a large crowd of TV crews and photographers from all over the world, as well as VIP guests such as Mr and Mrs Peake. Onlookers were allowed surprisingly close to the rocket despite high levels of security. Every inch of the track was checked ahead of the train while a circling helicopter lit up the ground with a bright search light. Now and then the train would announce its progress with a toot. One visitor, planetary scientist Professor Monica Grady, from the Open University, said: "It was totally awesome. I liked the way it hooted. 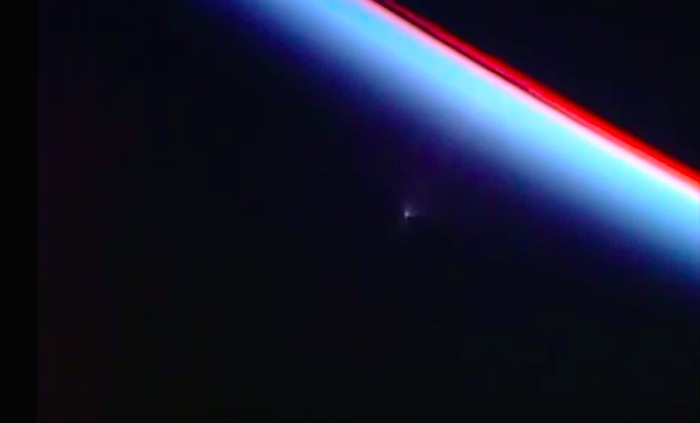 "It came out on the dot of 7am - rocket scientists know how to do it." 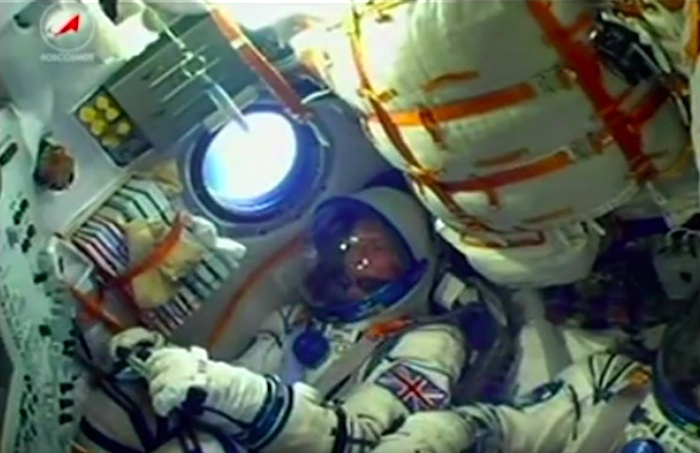 It will take six hours for the space capsule carrying Major Peake and his companions to catch up with the ISS, travelling at 17,500 mph. Docking with the space station is one of the trickiest stages of the journey. The whole process is automatic, controlled by computer, but can be carried out manually if required. 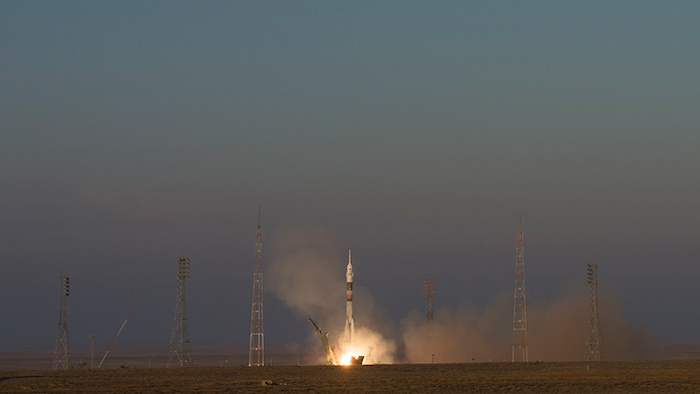 Speaking before the launch, Major Peake said: "Any time two vehicles come in close proximity in space is hazardous. "The docking needs to be closely monitored and you have to make sure you're on target and on speed." His mission, called "Principia" in homage to Sir Isaac Newton's ground-breaking text on gravity and motion, is symbolic of a turn-around in the UK Government's attitude to manned space flight. For decades it refused to have anything to do with human missions, preferring to focus on satellites and robot probes. 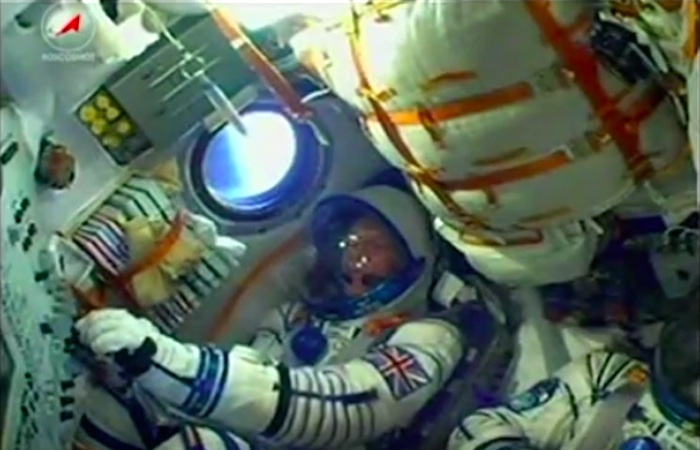 Then, in 2012, Britain agreed to start contributing funds to Esa's ISS programme. 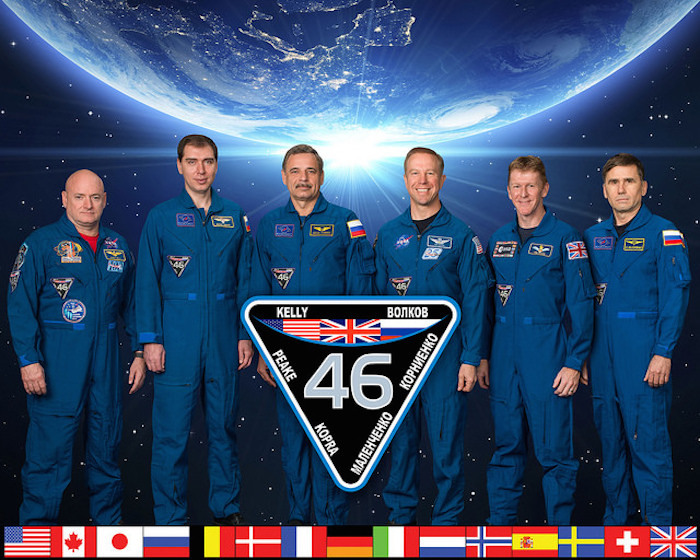 Whether or not this made any difference to Major Peake's selection for the current mission, officially designated Expedition 46/47, is open to speculation. 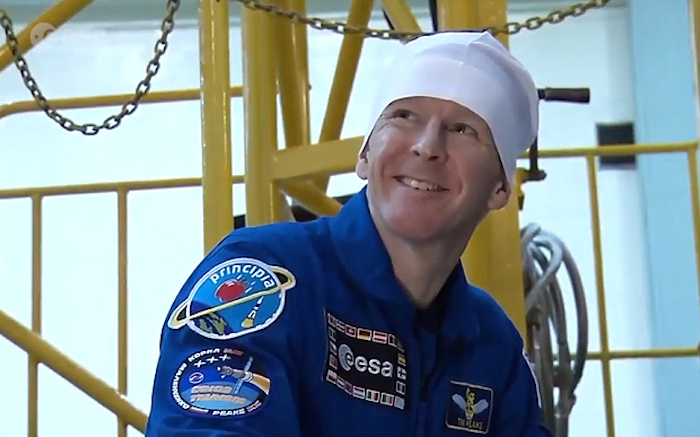 During his time aboard the space station,Major Peake will participate in 265 experiments, and observe the effects of microgravity on his own body. He will also contribute to the day-to-day maintenance of the space station's life support, power and communications systems. This could involve taking space walks, as well as more down-to-Earth activities such as fixing the 15-year-old suction toilets. In April he will run the entire 26.2 mile London Marathon on a treadmill aboard the space station. The first Briton in space was former chemist Helen Sharman who visited the Mir space station in May 1991. Her trip was made possible by a private programme called Project Juno, and paid for jointly by the USSR and a consortium of British companies. 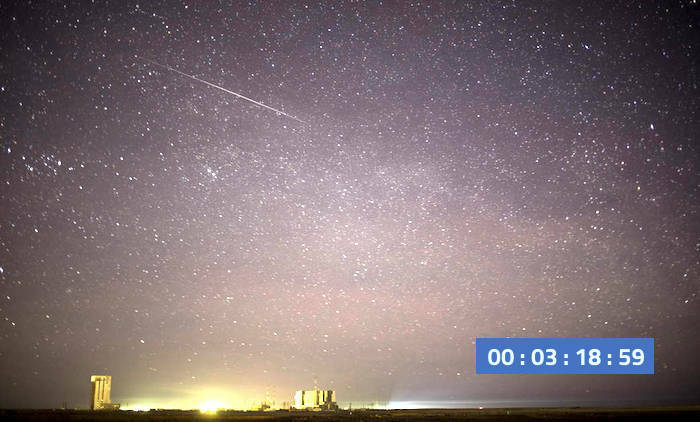 In this one minute exposure, a meteor streaks across the sky as the Soyuz TMA-19M spacecraft is rolled out by train to the launch pad at the Baikonur Cosmodrome on Sunday, Dec. 13, 2015 in Kazakhstan. 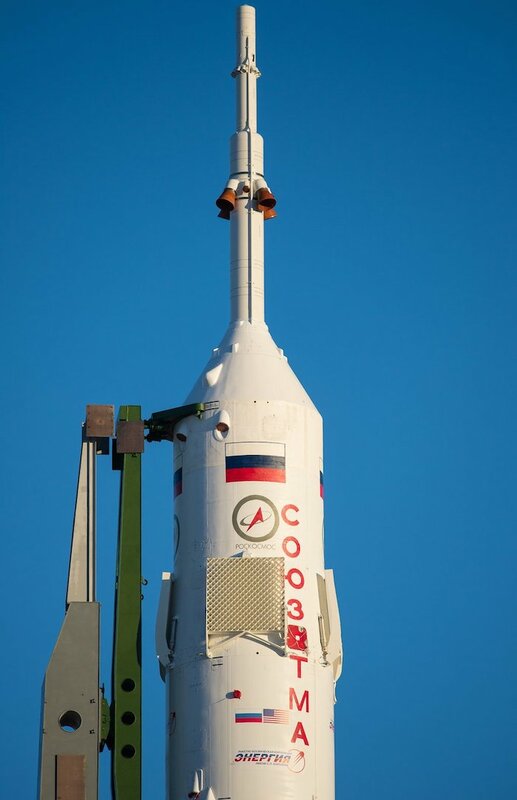 Launch of the Soyuz is scheduled for Dec. 15 and will send Expedition 46 Soyuz Commander Yuri Malenchenko of the Russian Federal Space Agency (Roscosmos), Flight Engineer Tim Kopra of NASA, and Flight Engineer Tim Peake of ESA (European Space Agency) to the International Space Station for a six-month stay. 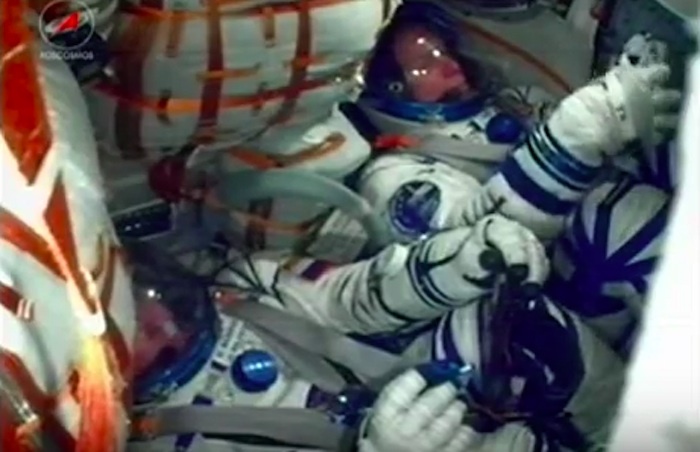 Astronauts Tim Kopra of NASA and Tim Peake of ESA (European Space Agency) and cosmonaut Yuri Malenchenko of Roscosmos have boarded the Russian Soyuz TMA-19M spacecraft that will carry them to the International Space Station (ISS). 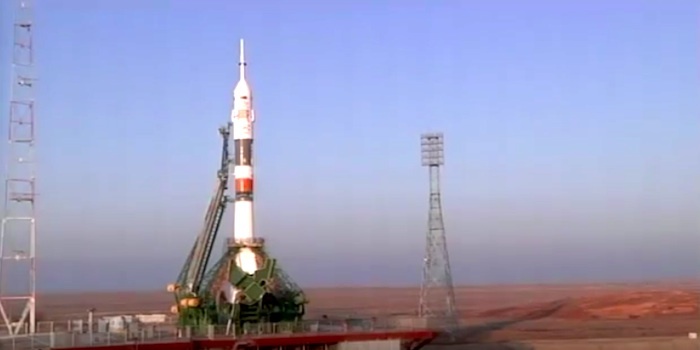 All is on track for lift off at 6:03 a.m. EST. NASA Television coverage of the launch will begin at 5 a.m. Watch on NASA TV or at: http://www.nasa.gov/nasatv. 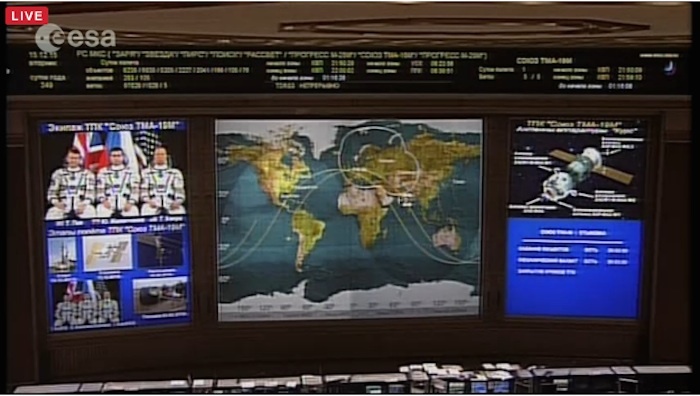 The crew is scheduled to dock to the station at 12:24 p.m. after a six-hour journey. 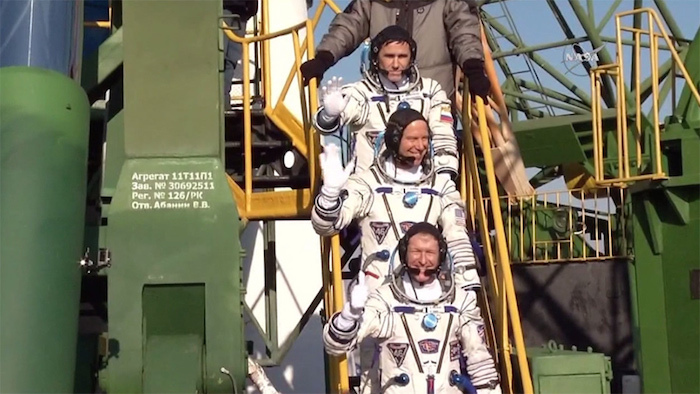 The trio will join Expedition 46 Commander Scott Kelly of NASA and Flight Engineers Mikhail Kornienko and Sergey Volkov, both of Roscosmos, bringing the total to six crew members aboard the ISS after operating with only three crew members for four days. 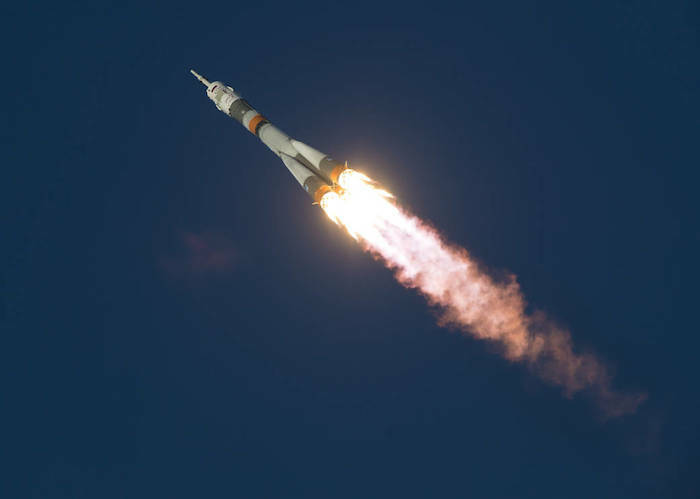 The incoming crew replaces Expedition 45 Flight Engineers Kjell Lindgren of NASA, Oleg Kononenko of Roscosmos and Kimiya Yui of Japan Aerospace Exploration Agency (JAXA), who all returned to Earth Dec. 11, 2015. 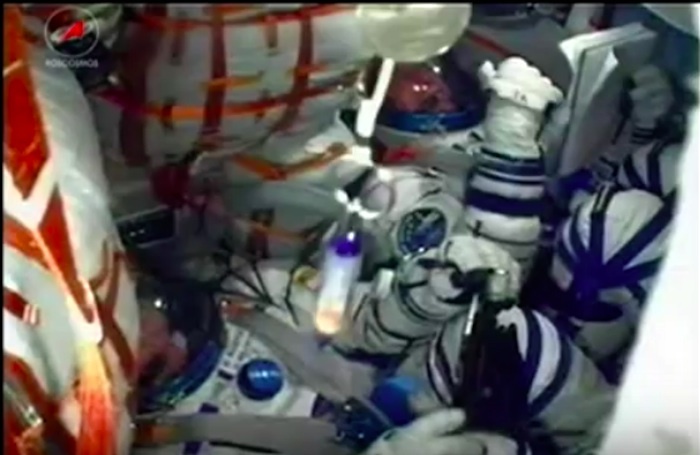 While both Kopra and Malenchenko have previously worked aboard the orbiting laboratory, this trip marks the first for Peake. 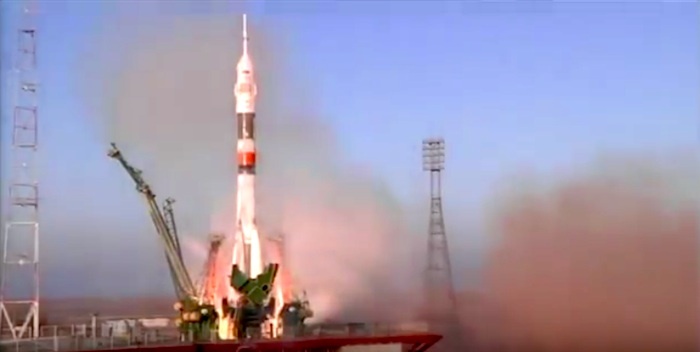 The Soyuz TMA-19M launched from the Baikonur Cosmodrome in Kazakhstan to the International Space Station at 6:03 a.m. EST Tuesday (5:03 p.m. in Baikonur). 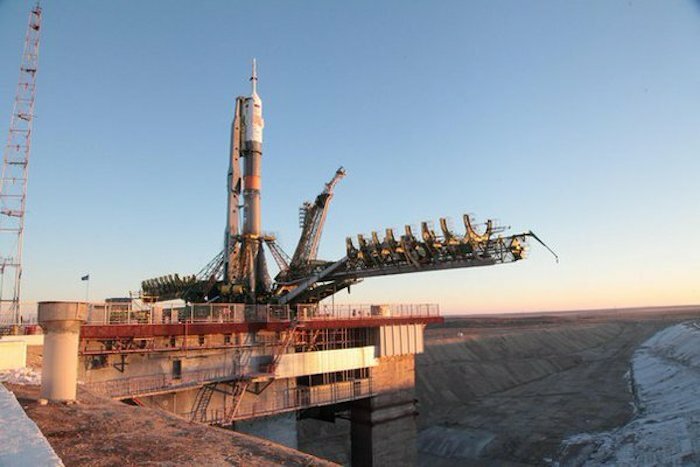 At the time of launch, the space station was flying 252 miles above northeast Kazakhstan. 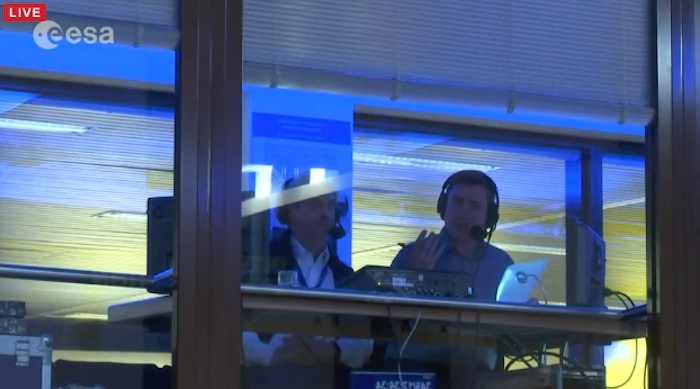 Tim Kopra of NASA, Tim Peake of ESA (European Space Agency), and Yuri Malenchenko of Roscosmos are now safely in orbit. NASA Television coverage continues: http://www.nasa.gov/nasatv. To learn more about the International Space Station, visit: http://www.nasa.gov/station. For launch coverage and more information about the mission, visit: https://blogs.nasa.gov/spacestation/. To join the conversation online about the International Space Station, follow @Space_Station. 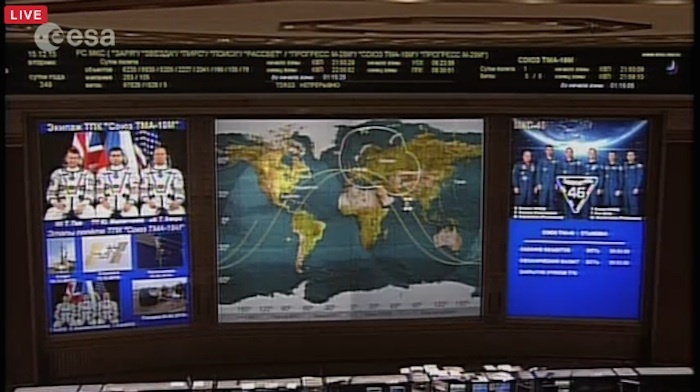 Docking of the Soyuz TMA-19M spacecraft with the Station is scheduled for 17:23 GMT (18:23 CET) with coverage resuming at 17:00 GMT (18:00 CET). Tune in again at 18:45 GMT (19:45 CET) for the hatch opening and press conference with the whole Space Station crew, including the new arrivals. 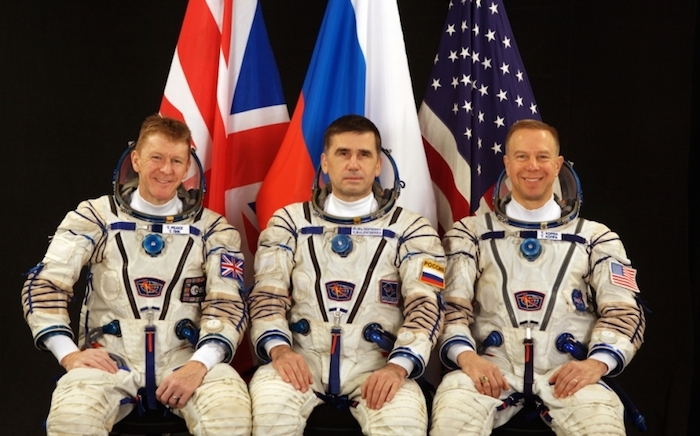 Tim, Tim and Yuri will spend six months in space working and living on the International Space Station.